Above are two 1945 Sentinel model 284 radios (click photo to enlarge). What a unique design! 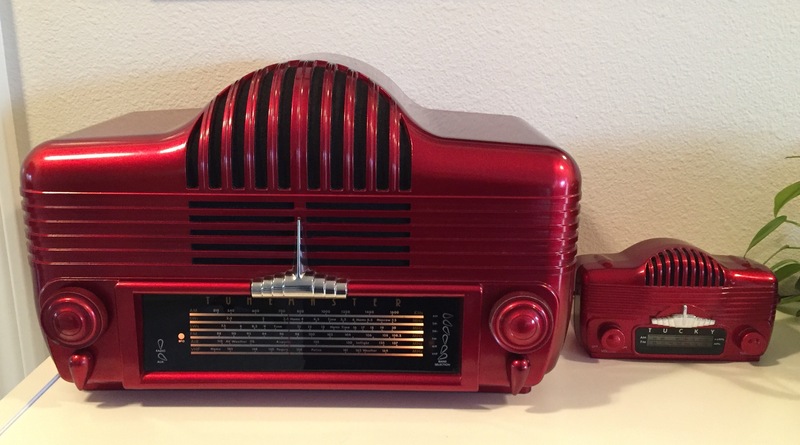 It’s the only Catalin radio model to have the chassis mounted upside down. That allows for having the controls at the top, and of course, inside the tubes are hanging upside down. The case is one of the most rounded Catalin designs, but the real appearance grabber is that Catalin “Wavy Grille”. 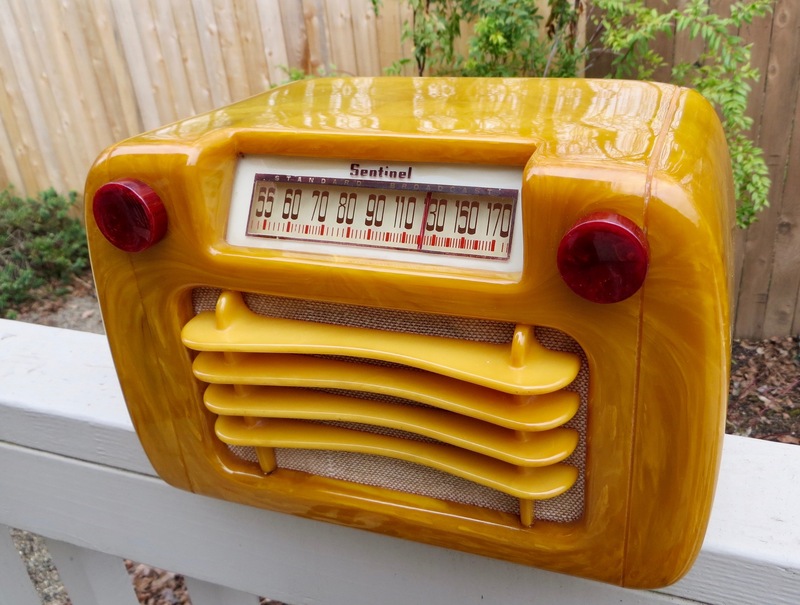 It gives the radio it’s nickname, and also provides a sense of quirkiness. There’s really no other radio like it. The size is about 11″ wide, 7″ high & 6″ Deep. 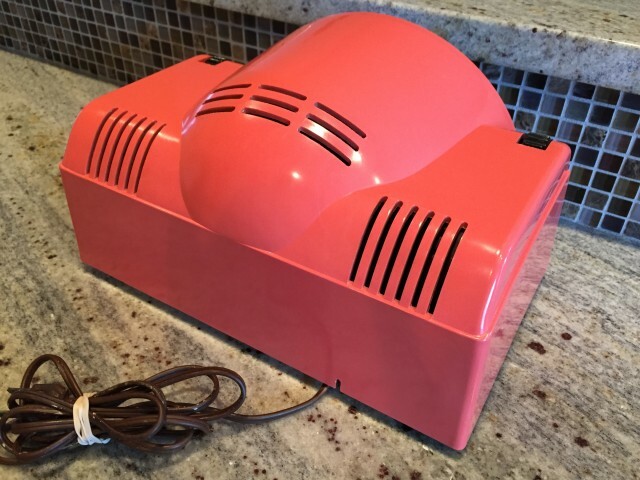 This version of the Sentinel has a case that’s called “sand”. 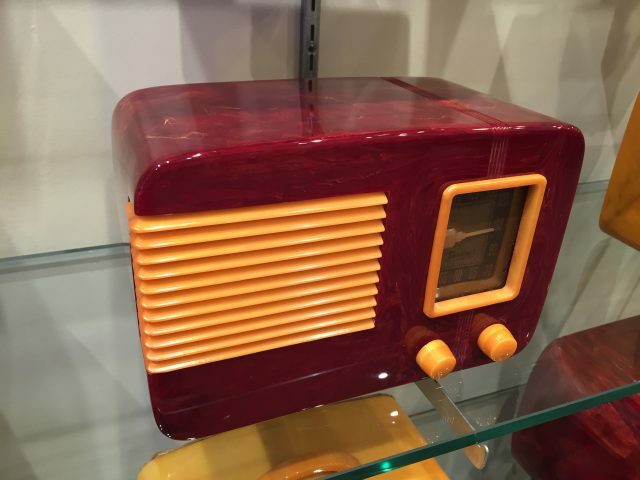 It’s a harder-to-find color, and is much more swirled and striking than the regular alabaster version that turns a plainer butterscotch. 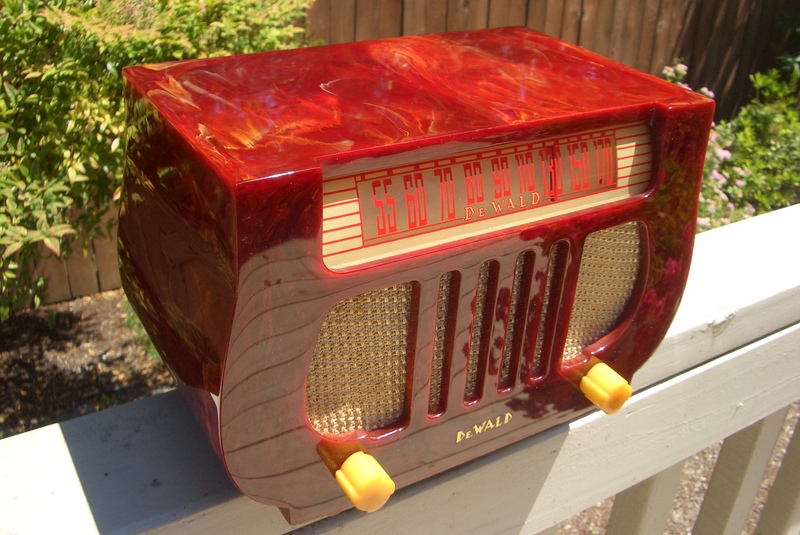 This sand version also has the seldom seen red Catalin knobs. 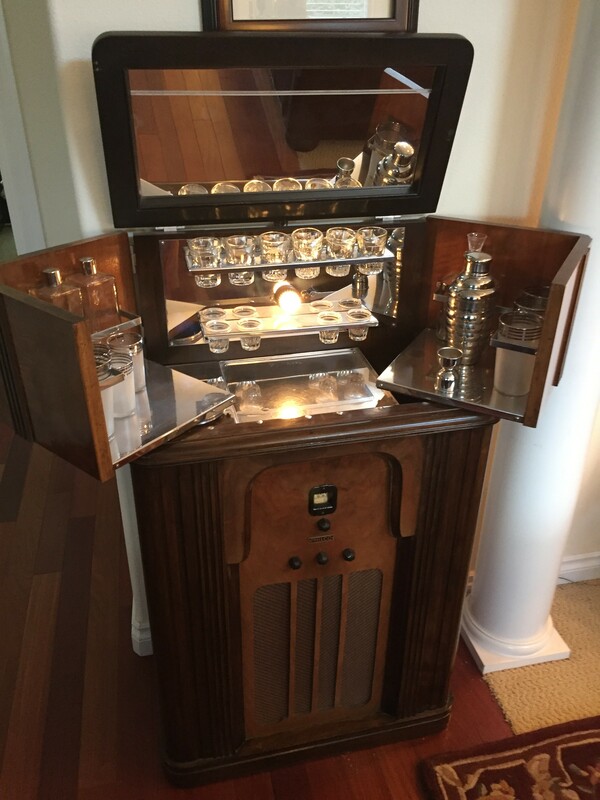 Too bad Sentinel didn’t manufacture a red grille to go with the knobs. 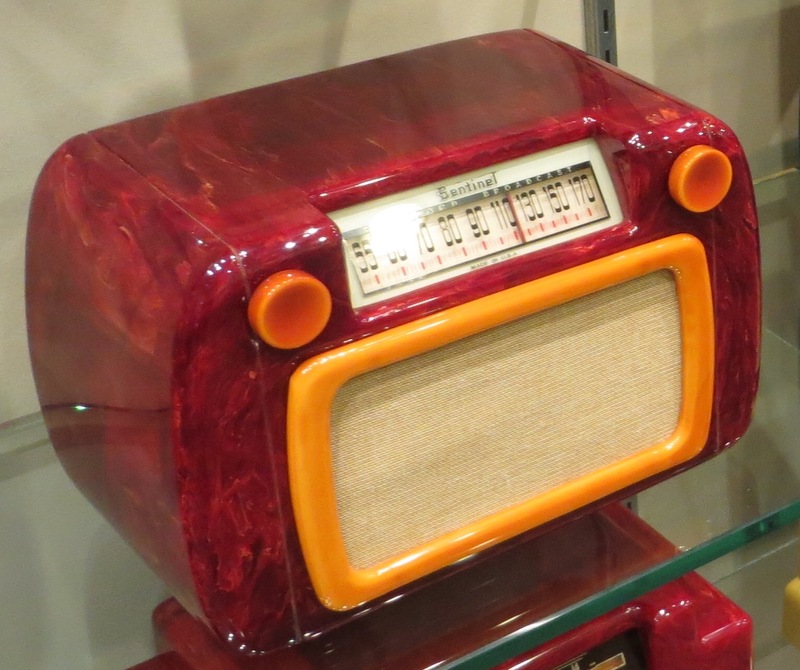 This burgundy-red case with nicely contrasting butterscotch knobs and grille is a popular color combination. 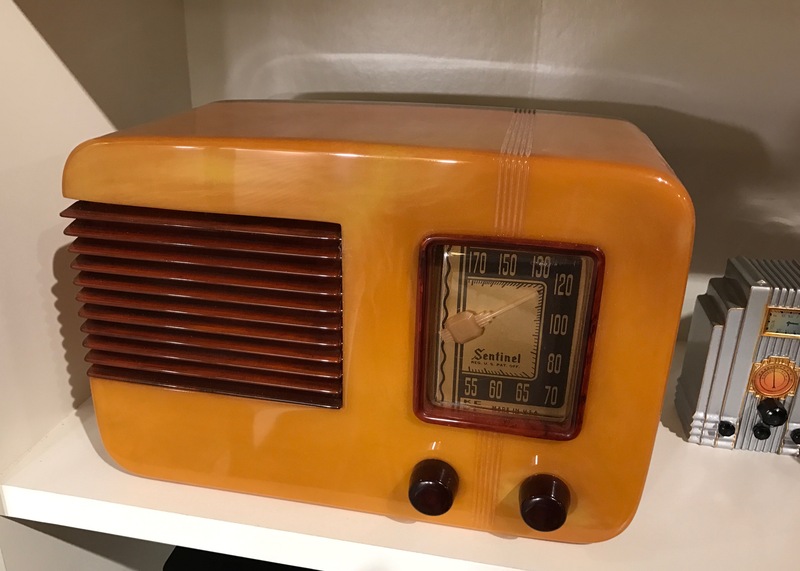 Sentinel produced a version of this radio without the grille…simply a Catalin surround and a large exposed grille cloth: It’s still a nice-enough looking radio, but it just seems like there’s something missing. 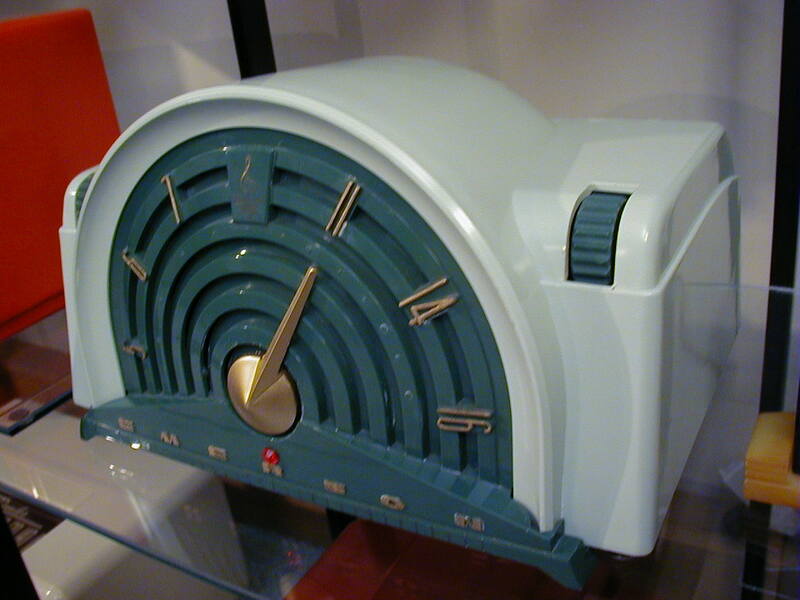 Sentinel also produced the open version under the name Musicaire. 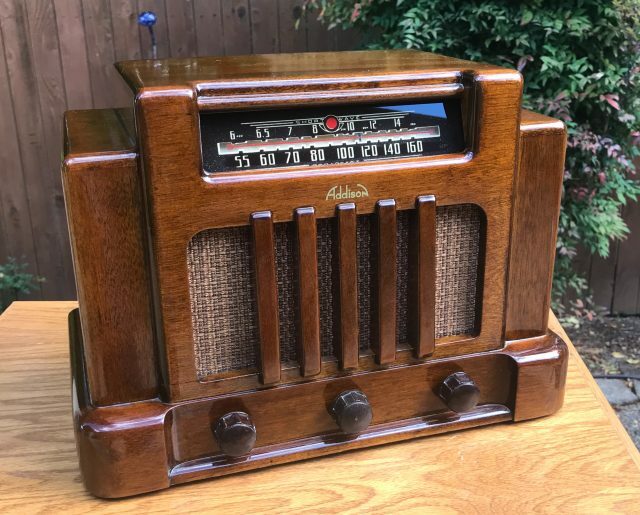 My favorite Sentinel design is the 248NI (177U)…from 1939. 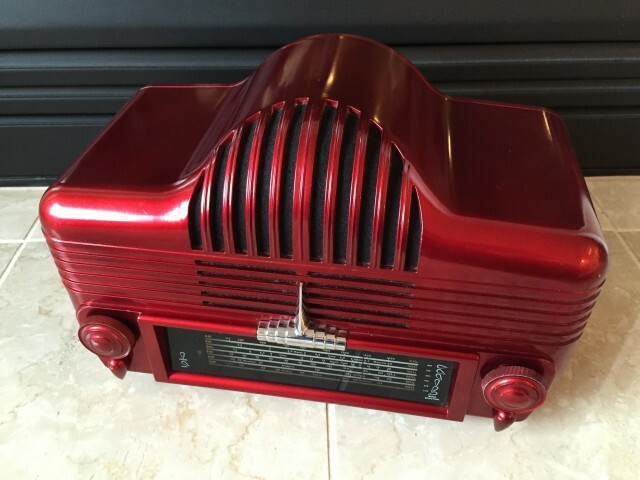 It features a slightly asymmetrical look with a grille that is not centered vertically, and wraps around the side of the radio. The Deco looking grooves are set to one side, and the dial pointer is is also on the side of the dial, rather than centered or at the bottom. 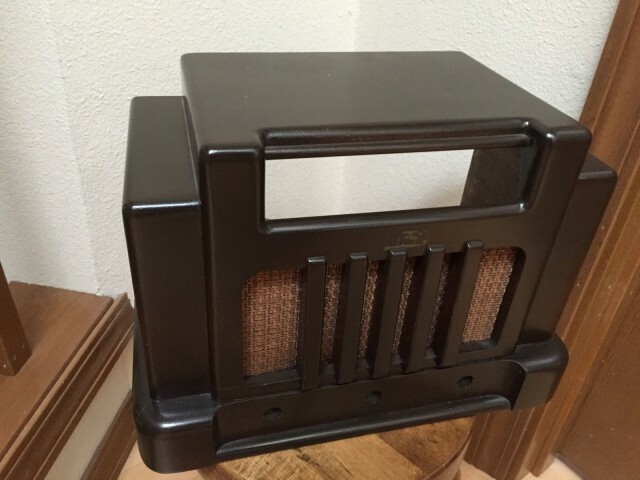 The trim, grille and knobs are all tortoise-shell for a nice contrast to the case. To me, it looks classy. 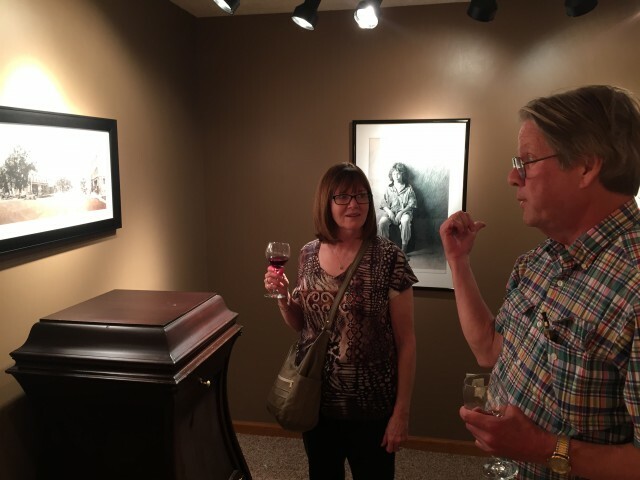 Some of you may have noticed the photo above is new as of March 2017. 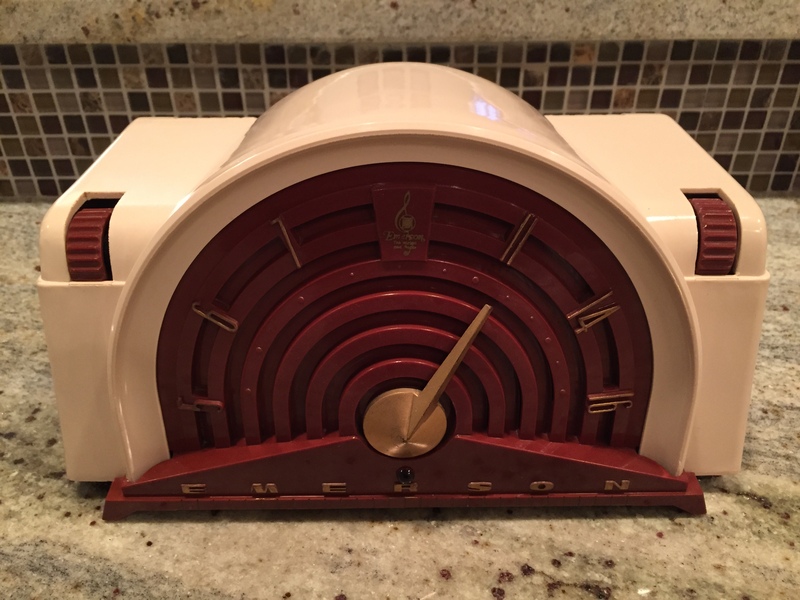 After more than a decade, I finally found an original dial pointer for it! 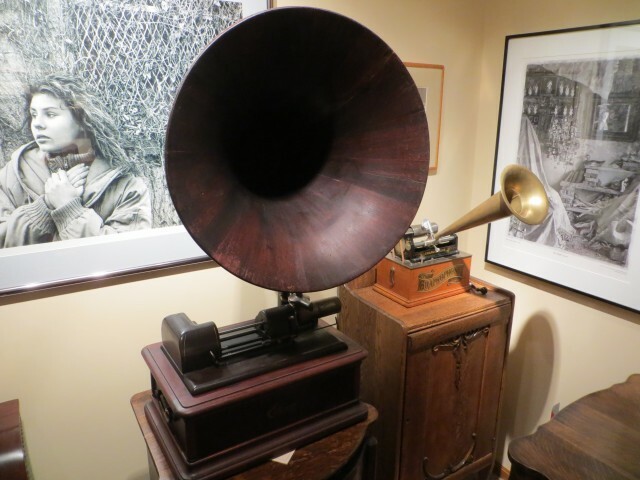 This burgundy version belongs to Hugh & Jane Hunt. 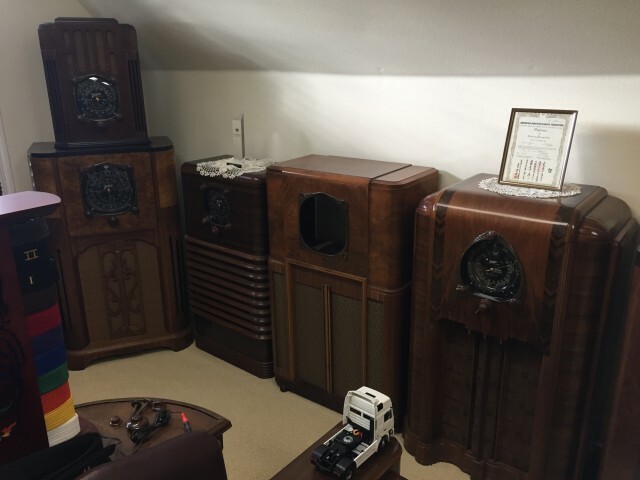 And finally, the 1940 Sentinel 195ULTA. 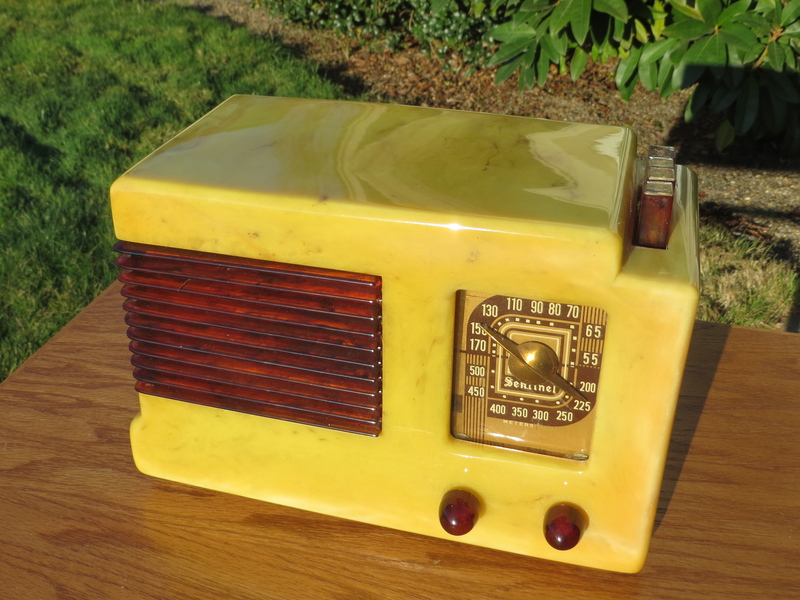 For this one, Sentinel added push-buttons for instant station selection. 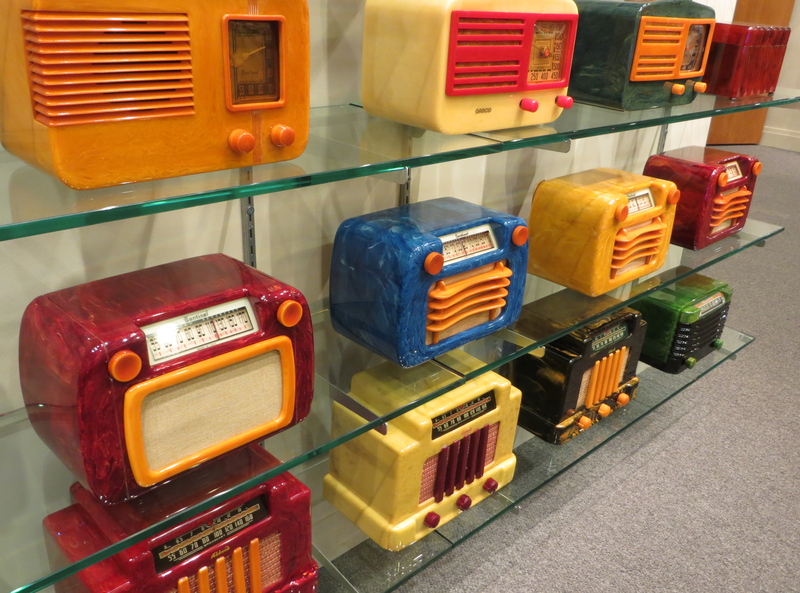 As the mid-1950’s hit, radios began to look boxy as mass production and low cost replaced design. 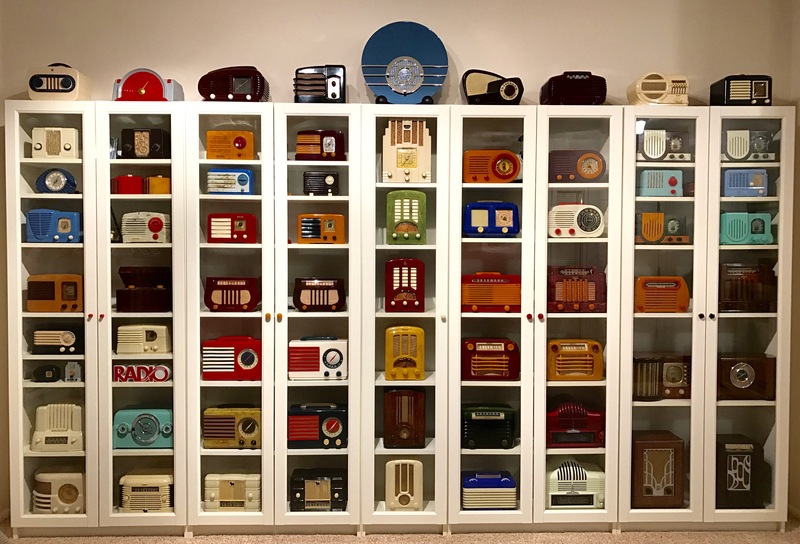 The majority became rectangular, and although there are exceptions, many late ’50’s and ’60’s radio designs are boring and tend to look similar. 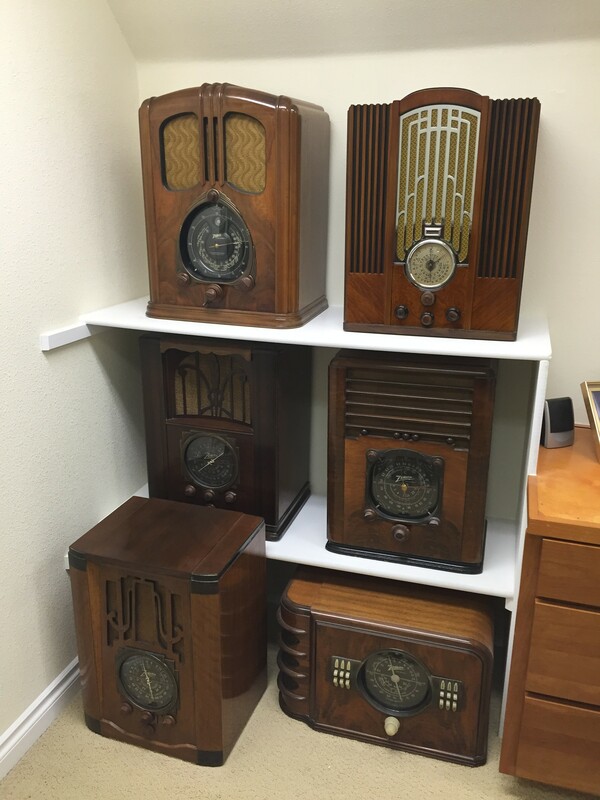 It’s not like any other radio. 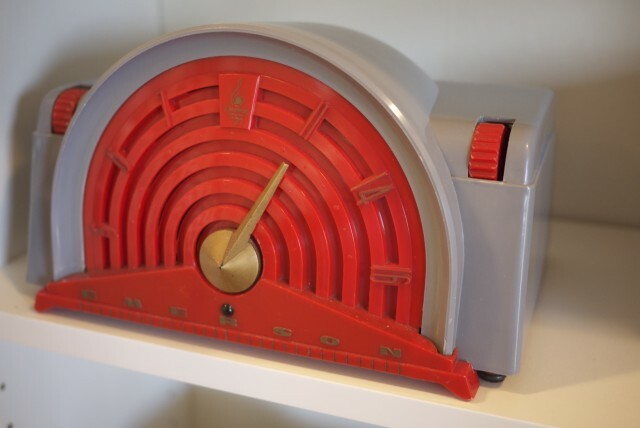 The large plastic grille & pointer look like a giant speedometer. 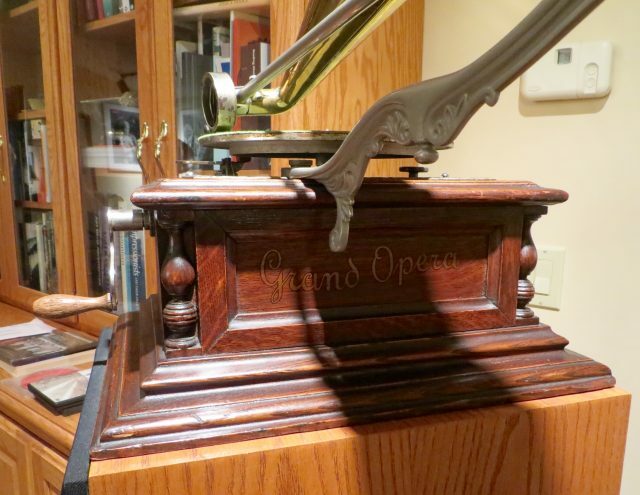 The main part of the case reminds me of an orchestra shell…like the Hollywood Bowl. And the back looks like it’s covering an electric turbine. 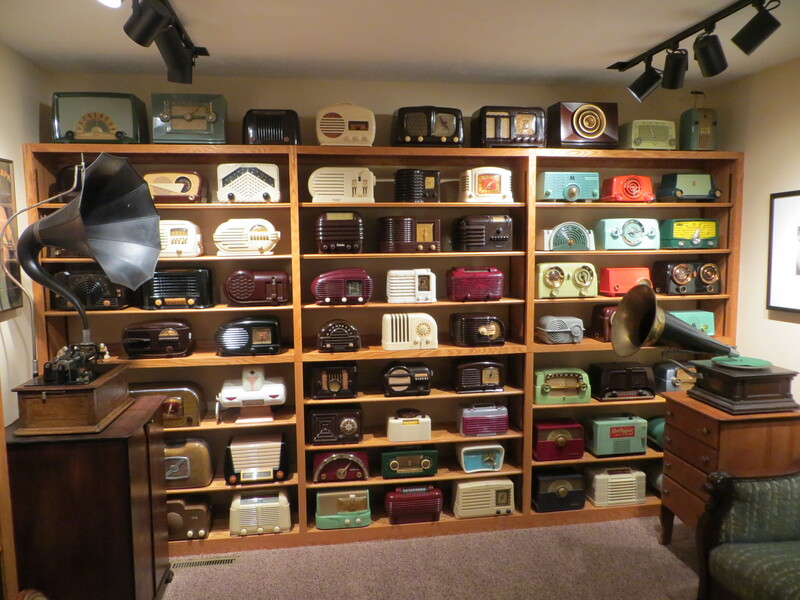 As you can see, the Emerson 744B came in a nice variety of colored Plaskon cases. 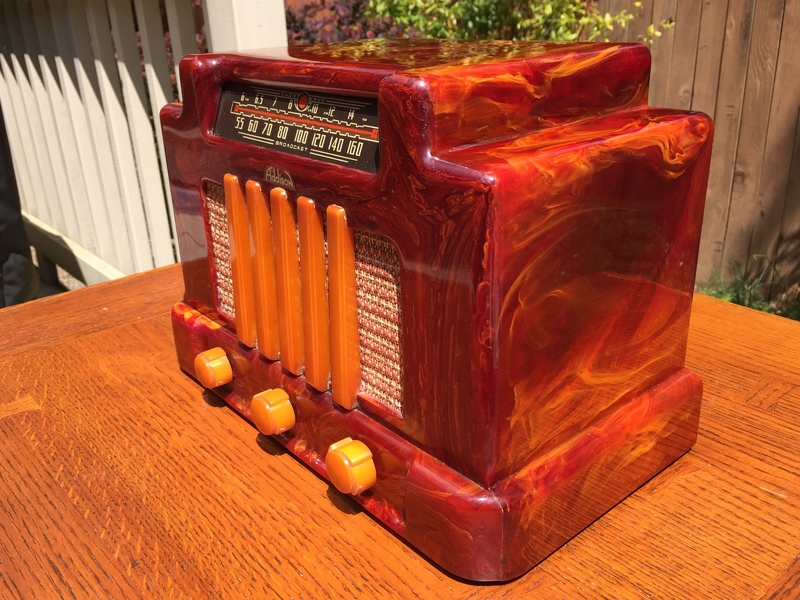 I always thought it would have made a great office desk radio, because the back would look cool to guests. 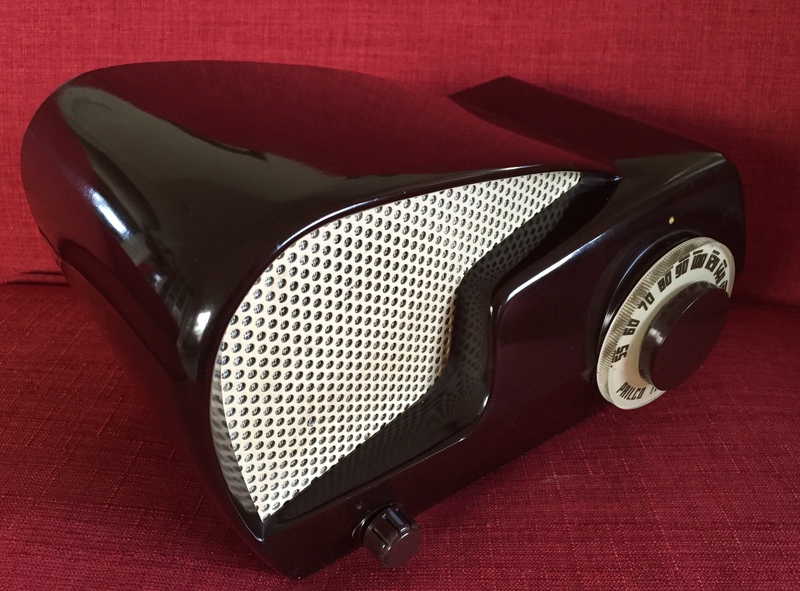 Most radios have cardboard backs, or even open backs, but this one looks good from every view. If you’d like to add a 744B to your collection, the first thing to look for is whether the faux front feet have broken off. The design makes it easy to break those feet when the radio is serviced or even when the radio is just being handled. In the above photo, you can see the thin plastic, and how the faux feet are not reinforced in any way. Even though they look like feet, they cannot support the radio when the actual feet are removed for servicing. 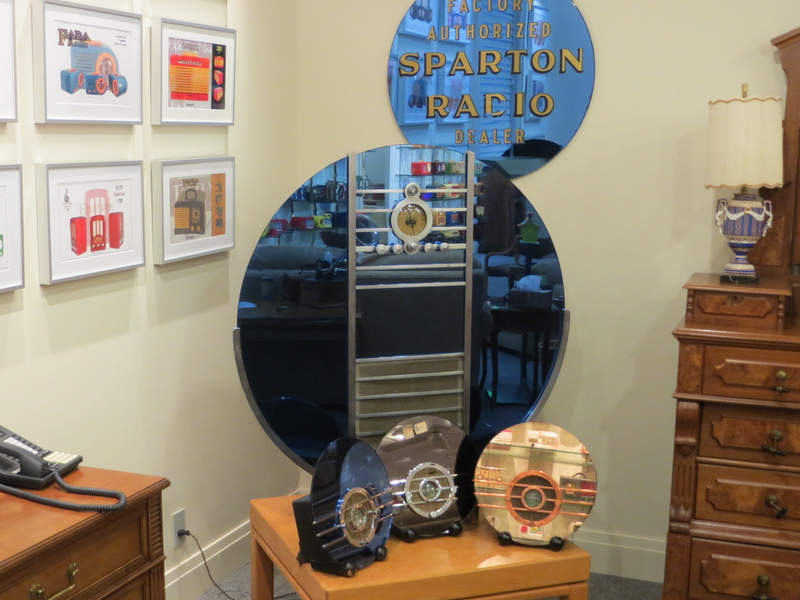 Basically, the radios with unbroken feet are worth about double those without. Symmetry is pleasing. It gives us a natural balance. Things just look right with even sides and a nice easy-to-understand presentation. People who have symmetrical faces are considered more beautiful or handsome. Most radios are symmetrical. One side matches the other. 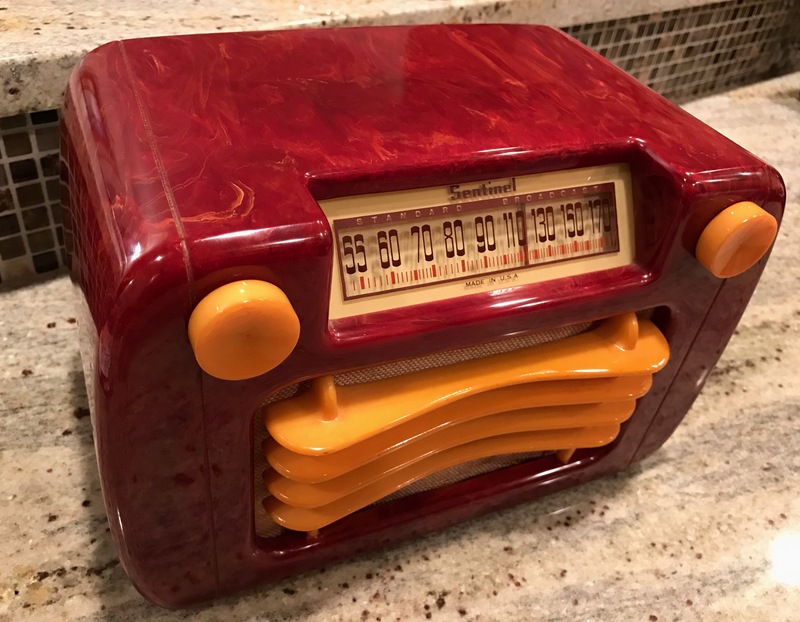 So, why did someone design a radio that looks like this? Basically, the whole design of the Philco 49-501 is amazingly asymmetrical! 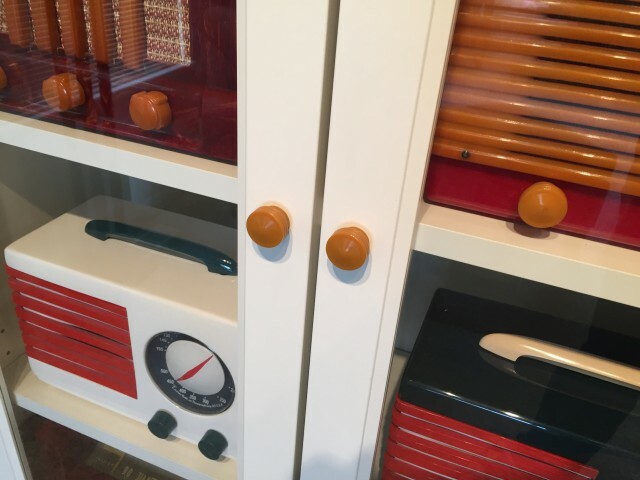 The only things symmetrical in the design are the round knobs (although of greatly different sizes), and the bottom, which is rectangular. 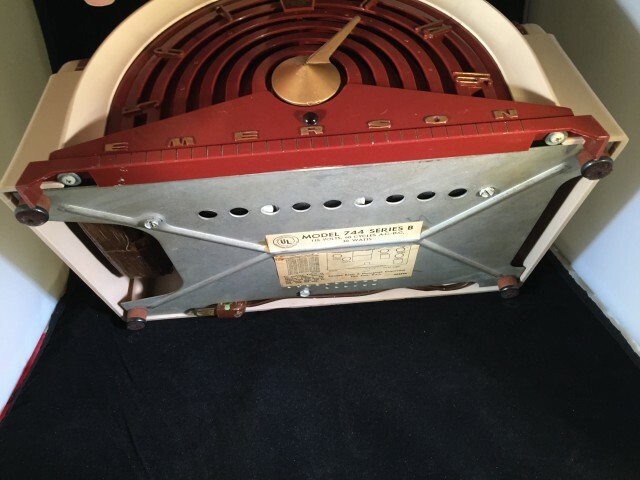 As we look at it, the left side of this 1949 Philco “Boomerang” is a large sweeping arc. The arc itself is uneven. 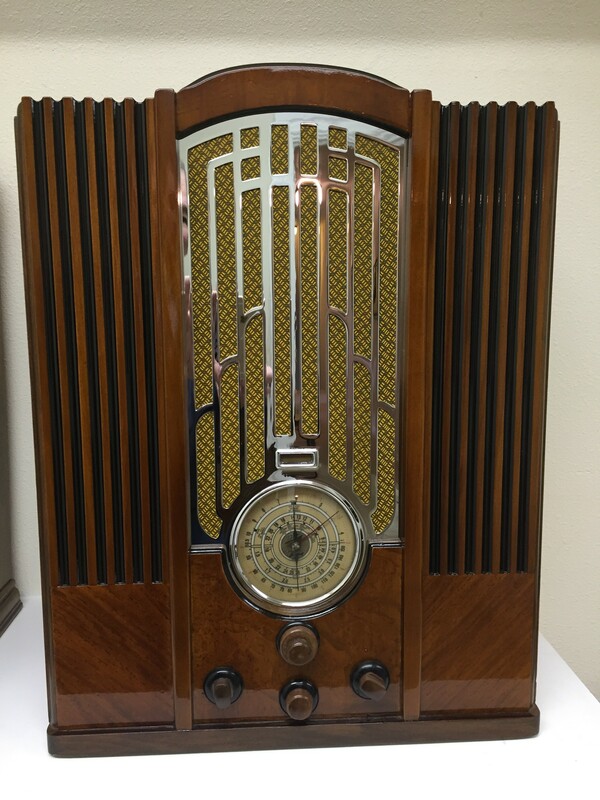 The radio’s right side has two fairly straight surfaces that are two different sizes at two different angles. 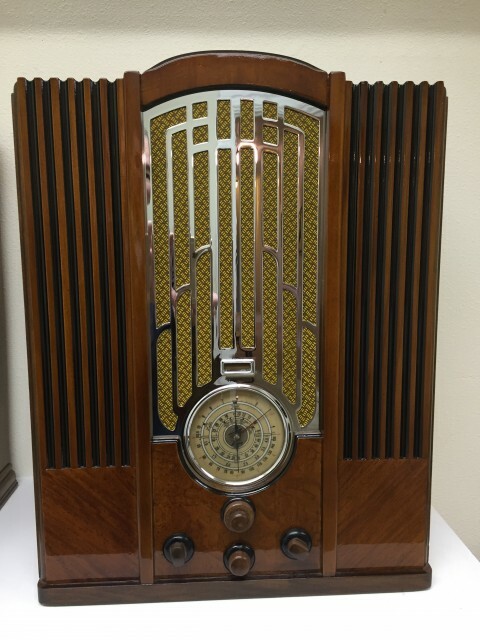 The front of the radio is more curved than flat. And what’s with that speaker opening?! Nothing about it is equal. The two levels of the Bakelite that form the bottom of the speaker opening are two different sizes at two different heights. The Bakelite lip of the big curve angles into the speaker grille with a wildly changing sweep…from small to large to small again. It would be expected that the big curve would naturally join the top of the radio even with the front. 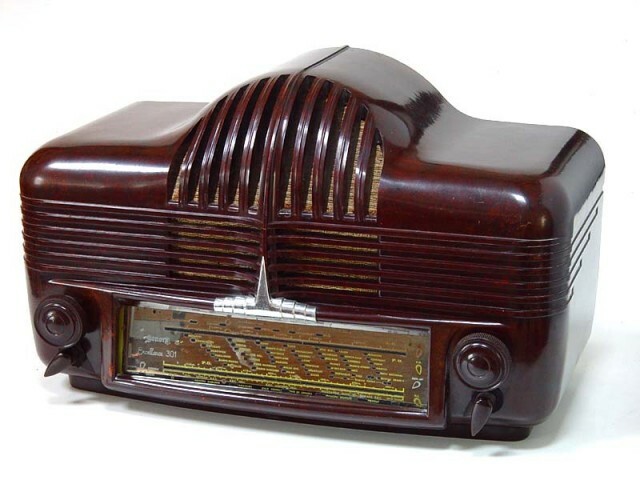 But instead, the top of the curve narrows and meets the right side of the radio farther inside. 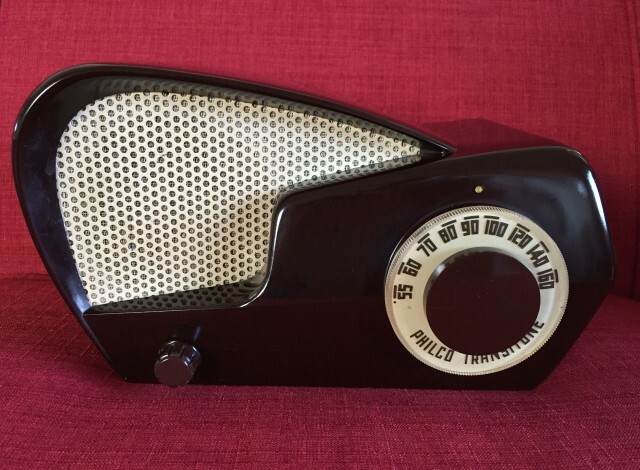 There is no designer credited with this Philco model. 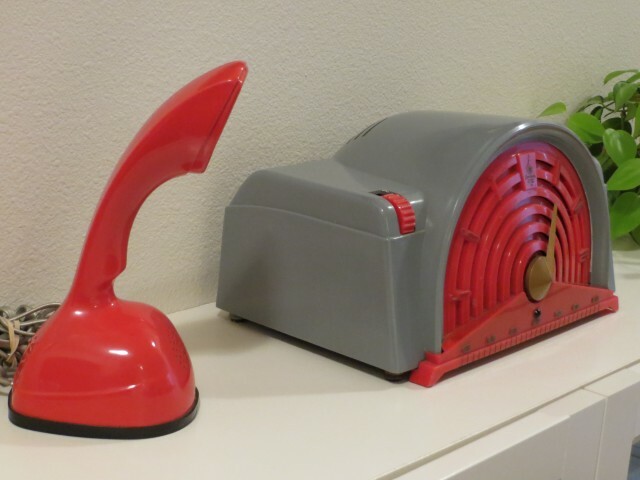 It’s a shame, because it’s an ingenious asymmetrical design…extremely well thought out. 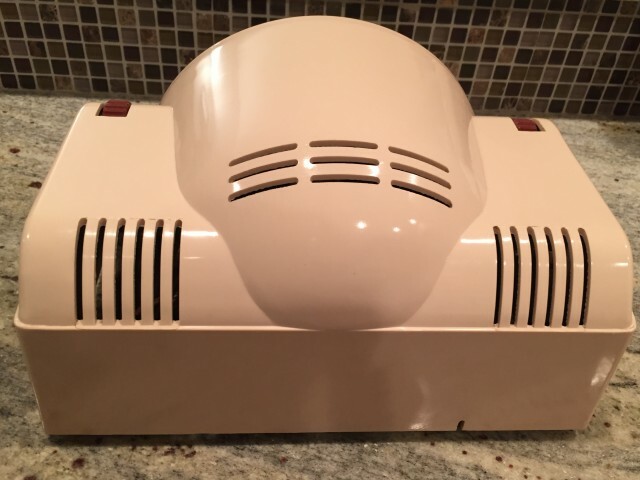 Some people think it’s weird or futuristic looking (often called “Jetsons” in eBay listings). But, it’s one of my favorite designs, because it’s so complex and bold. 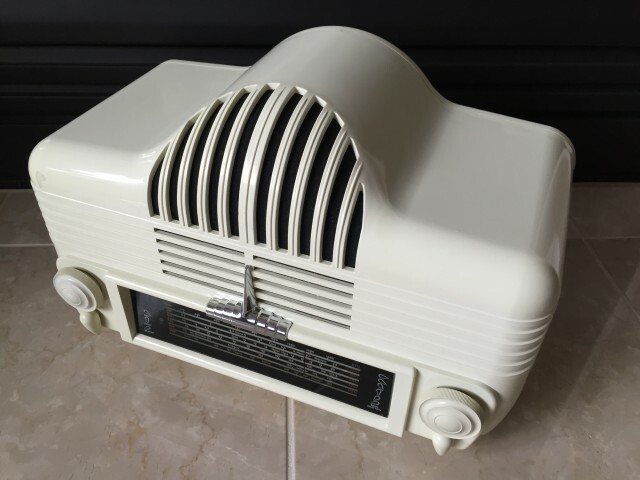 Below is the ivory painted version of the Philco Boomerang. 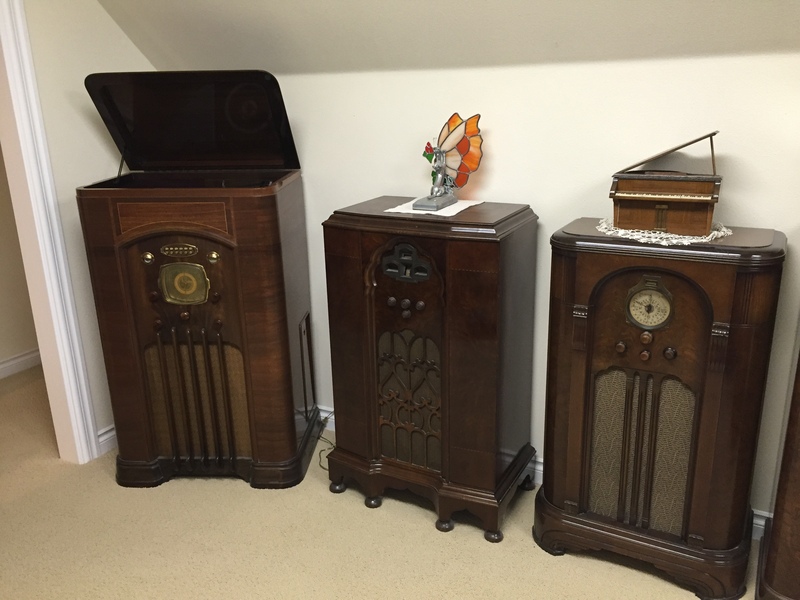 This photo correctly shows the differences compared with the brown Bakelite version. 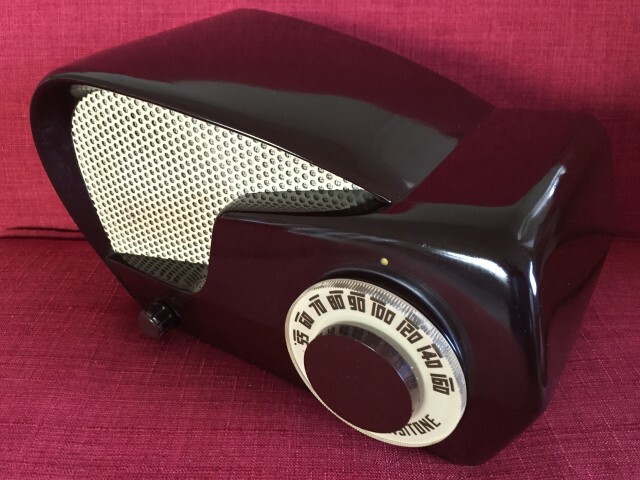 The grille is brown, the tuning dial has a brown background with white numbers, and the knobs are white. Often, Boomerangs have incorrectly matched parts, or are painted wild colors. This is the only painted version that’s original. Some of the paint jobs can look pretty cool (stay away from one that looks like camouflage and claims to be “Catalin colors”). You definitely want to know what you’re getting. 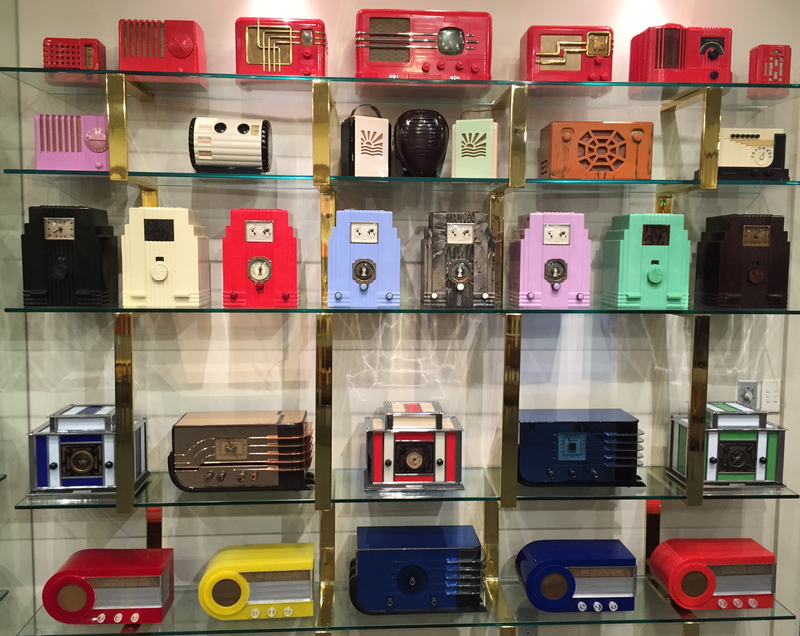 The radio is approximately 11-inches wide, 7-inches high, and 6-inches deep. But really, it all depends on where you measure it, because nothing is even! For a more symmetrical radio that’s still highly original, check the one in the article below. 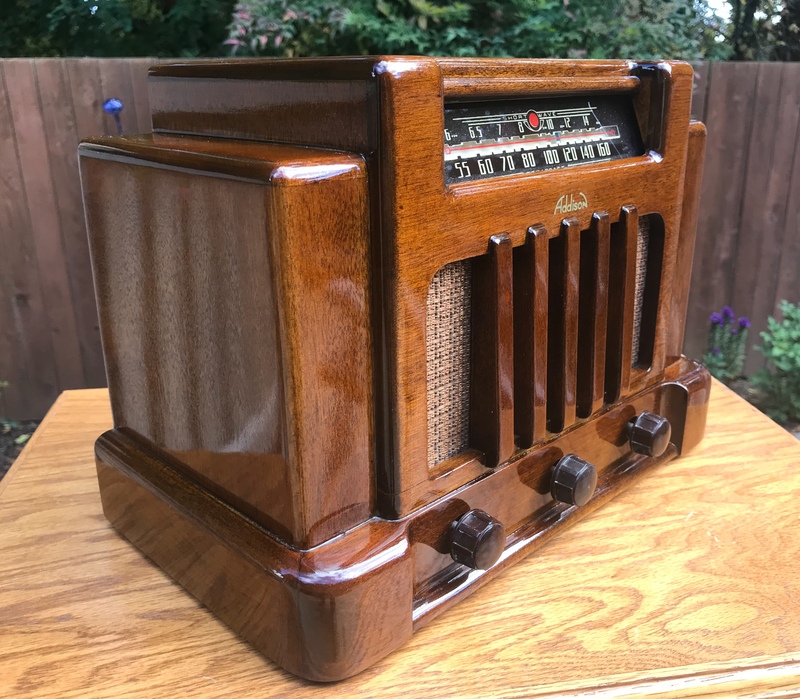 Years ago, I had a wooden Addison 5 “Courthouse”, but for some reason sold it when I got a Catalin version. Later, I regretted selling it, because it’s truly a uniquely designed wooden radio. So, when the above case was reasonably priced on eBay, I bought it. Unfortunately, the refinish on it was awfully dark, and looked more like paint than wood stain. 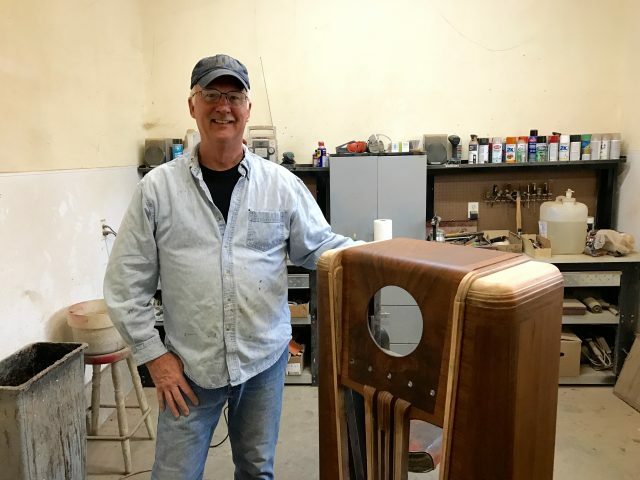 Fortunately, expert Gary Marvin could bring out the beautiful wood. 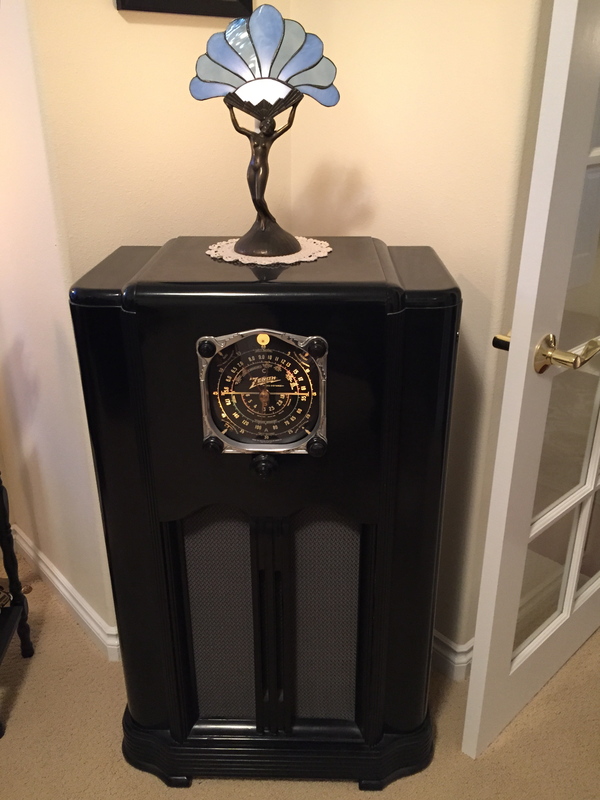 While he was working on the case, I found a chassis, restrung the dial, replaced the missing dial pointer, replaced a tube, remounted the loose dial, and did a cleaning…all stuff that doesn’t take any real talent. There are some differences. The Catalin radio has a flat front, while on the wooden one, the front juts out a little. Although both versions use the same model chassis, the wooden Addison is slightly larger, because the wood is thicker than the Catalin. If you want to see more of Gary’s restoration work, please check out his impressive collection in the post below. 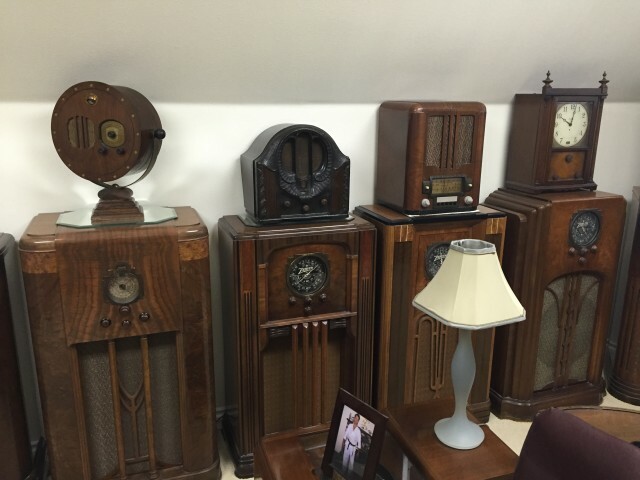 Wanted to show you some of the radios in Gary Marvin’s collection. 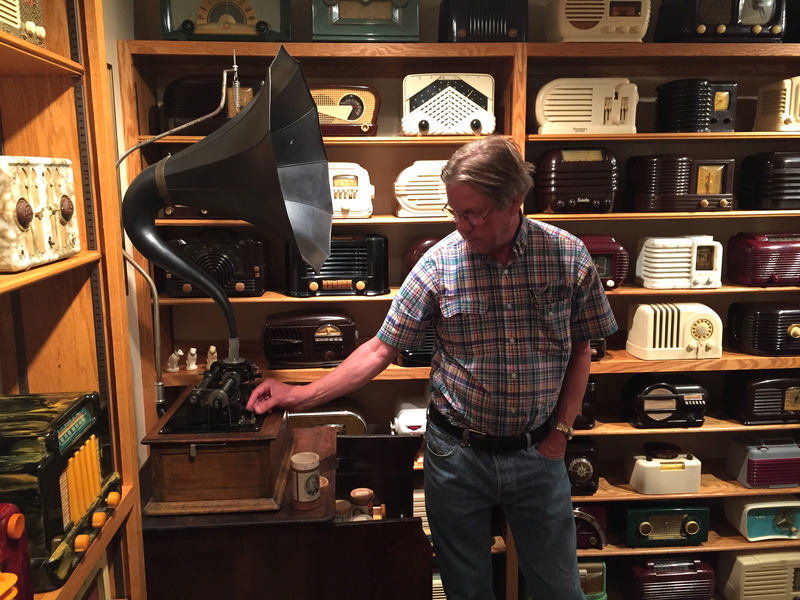 He mainly collects and restores consoles and large tombstone radios. The following series of 6 photos will take you around one large room in his house…flowing from left to right. 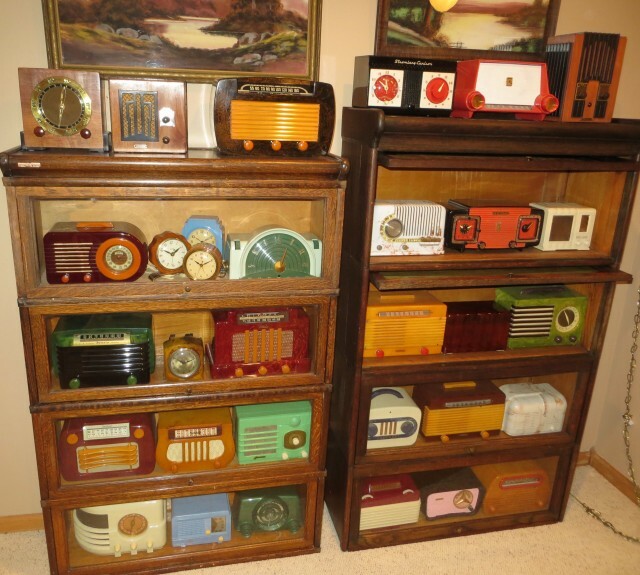 Those of you who collect consoles and other wooden radios will have noticed some highly collectible models! In another room you’ll find some really great tombstones! 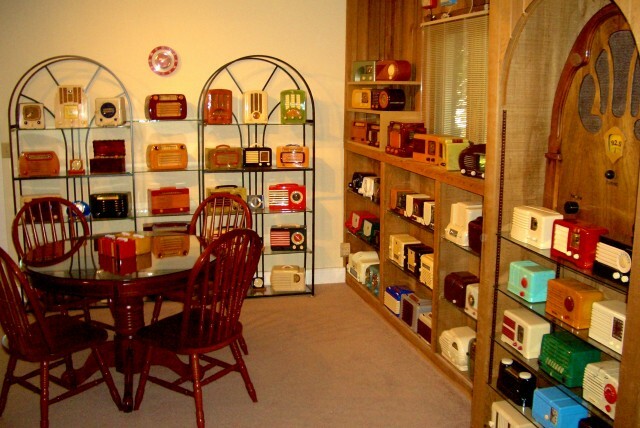 Gary & his wife, Vanessa, have many more radios throughout their home. Gary designed a specially built area as part of their large garage where he refinishes and restores radios as a near full-time job. At any time you might find 10 completed consoles covered protectively in his garage, several partially-finished in the work areas, and more of his beautifully restored radios in antique stores. 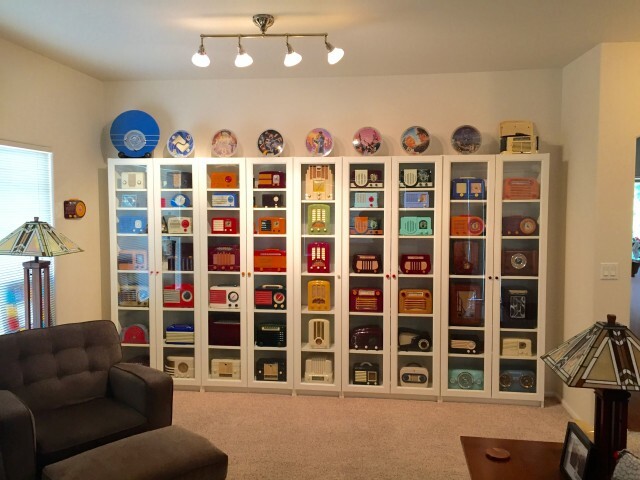 What’s the best way to display a radio collection? There’s no one right answer. The space available in your home is the main factor. 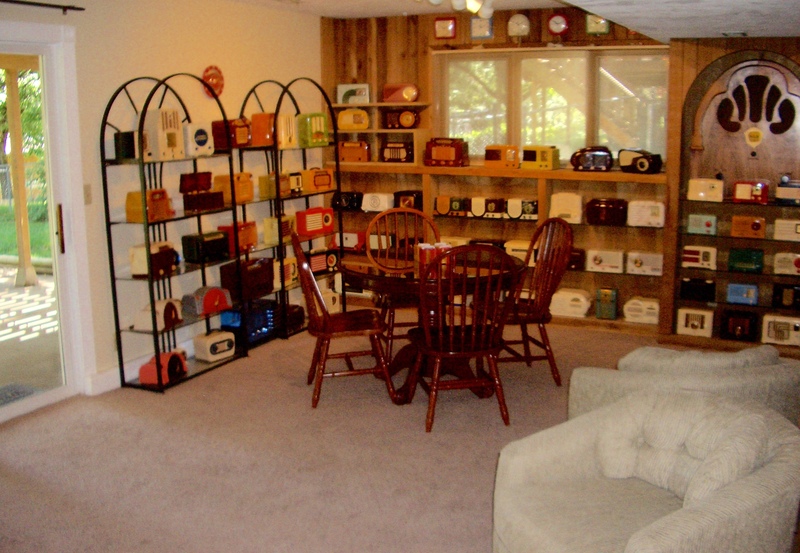 When we were in Lincoln, Nebraska, we had a large walk-out basement with some built-in shelves, and then we added more non-permanent shelving along the walls. 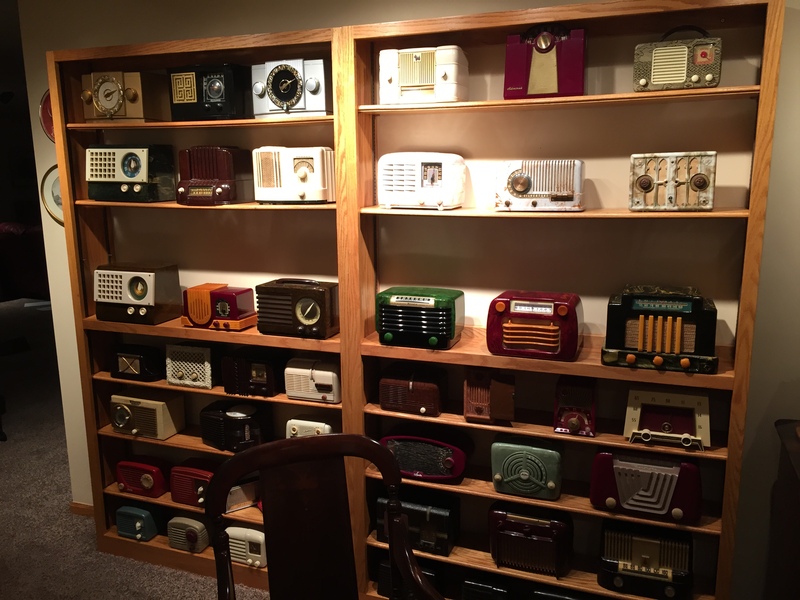 We also added some overhead flood lights in order to show off the colors and features of the radios. It worked fine: The above photos are poor quality, but at least you get the idea. There was another unit of those metal shelves on the other side of the door, plus a small amount of built-in shelves by a fireplace. 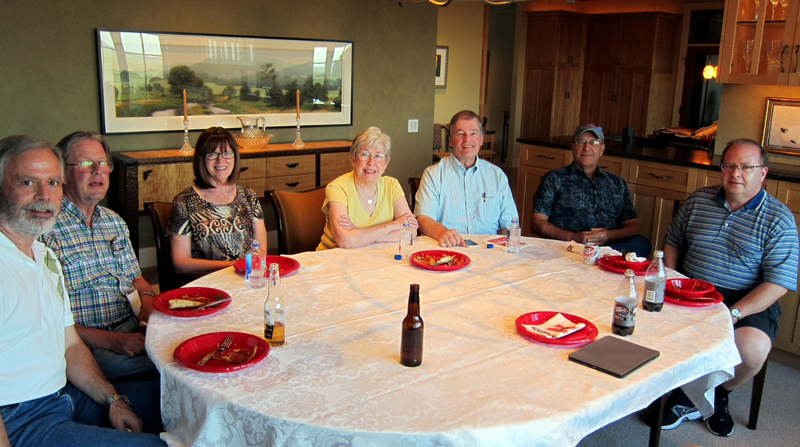 When we moved to Oregon, we found most houses here don’t have basements. 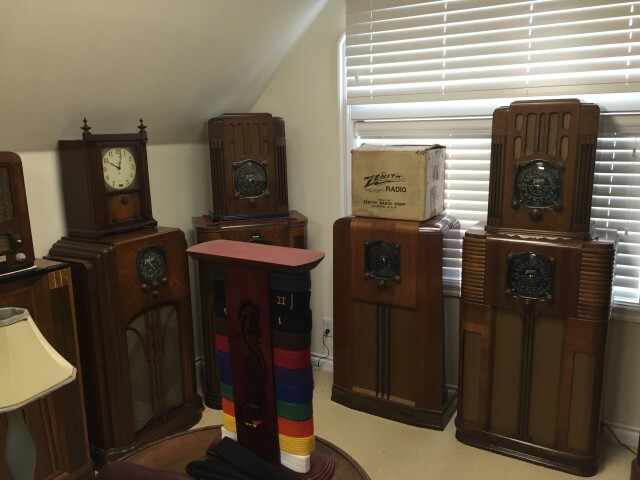 My wife suggested the radios would add needed color to our living room. 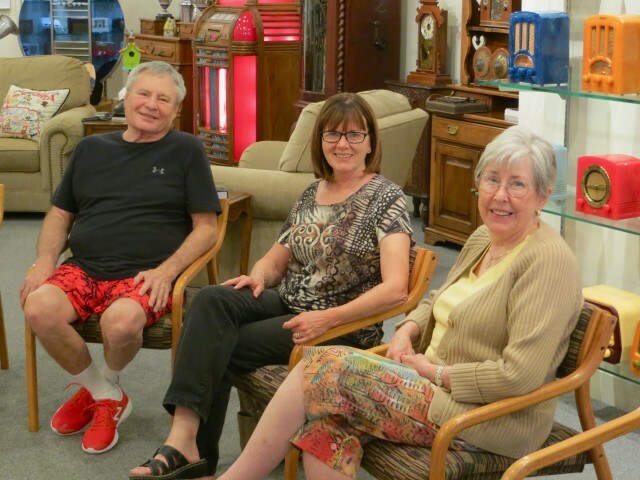 So, we purchased some bookcases that have glass doors, and used a large living room nook that the previous owners had also used for bookshelves. Above Are two photos of our main display (updated in late 2016)…doors closed & doors open. 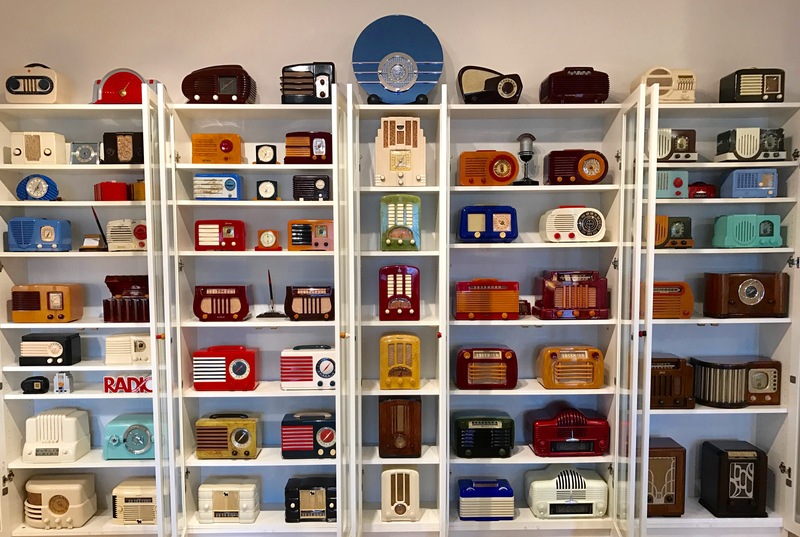 Since the display is located at one end of our living room, it provides guests a colorful introduction to our collection, and of course gives us a topic of discussion if they would like to know more about the radios. Just for fun, I replaced the white door knobs with radio knobs: The radio knobs were not damaged. 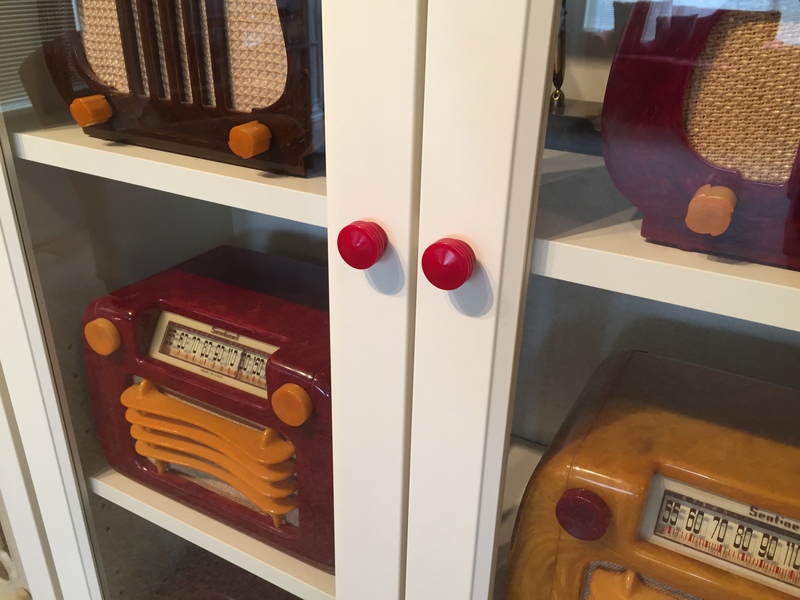 I placed cut off screw holders (that are used for dry wall) into the back of the knobs, and used screws to hold the knobs in place. By the way, the bookcases were reasonably priced at Ikea. My son, Paul, and I assembled them, connected them together, and then secured the whole thing to the wall. 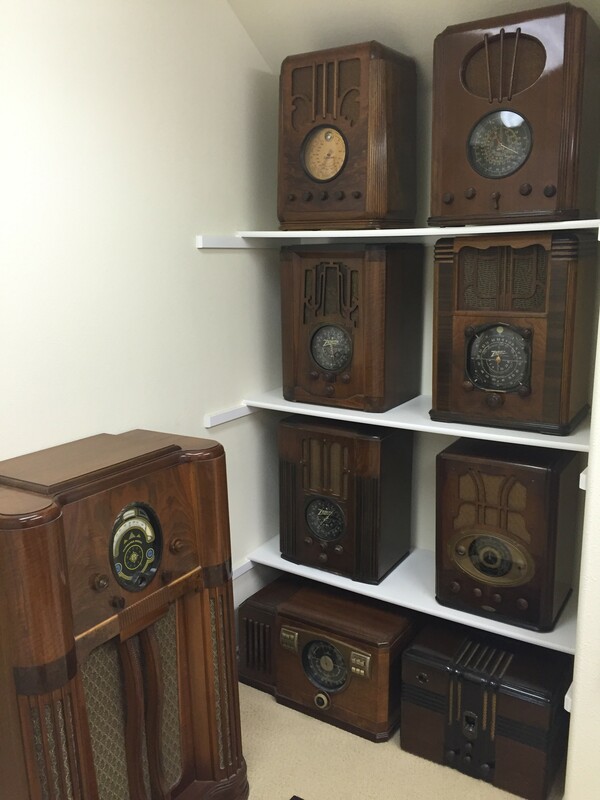 The shelving is adjustable, so I bought a few extra shelves to make areas for smaller radios. 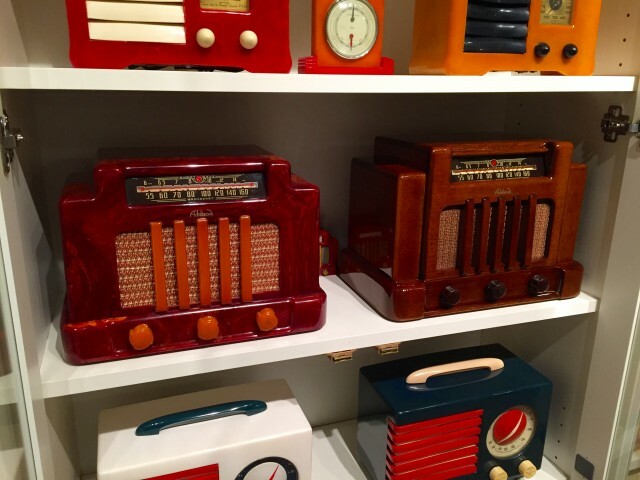 The lineup of radios keeps changing as models are sold and others purchased. The next two posts below show a lot of ways to display radios. One of our collecting friends in Nebraska is David O’Hanlon. His collecting goes beyond radios, to include phonographs, Vogue Records, drawings & paintings by noted Nebraska artist Kent Bellows, and much more. Jeannette & I especially enjoyed learning more about Dave’s phonographs. 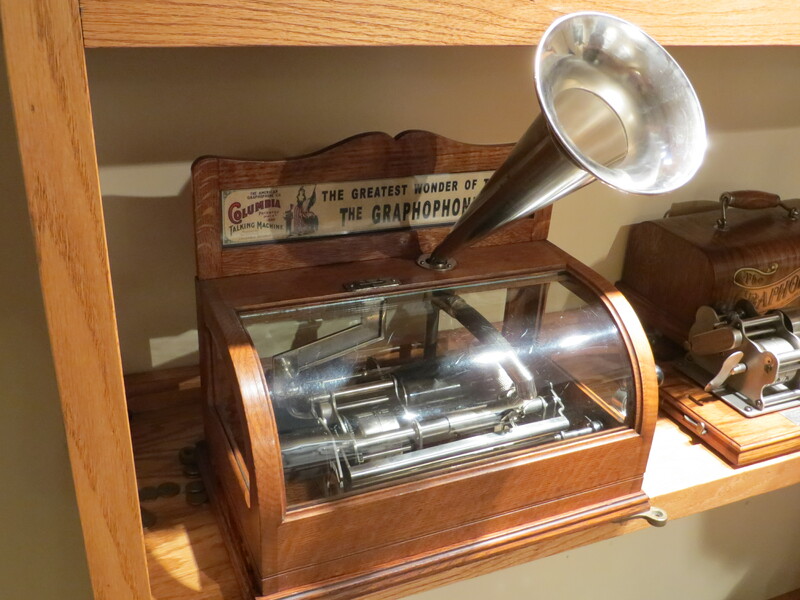 This last one is a coin-operated phonograph with one selection on a cylinder… “Take Me Out To The Ball Game”. The phonograph takes nickels from the 1800’s. 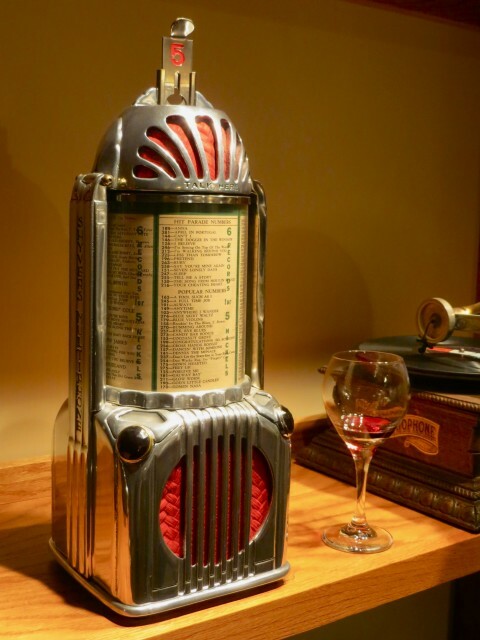 The above “Jukebox” is a Shyvers Multiphone. 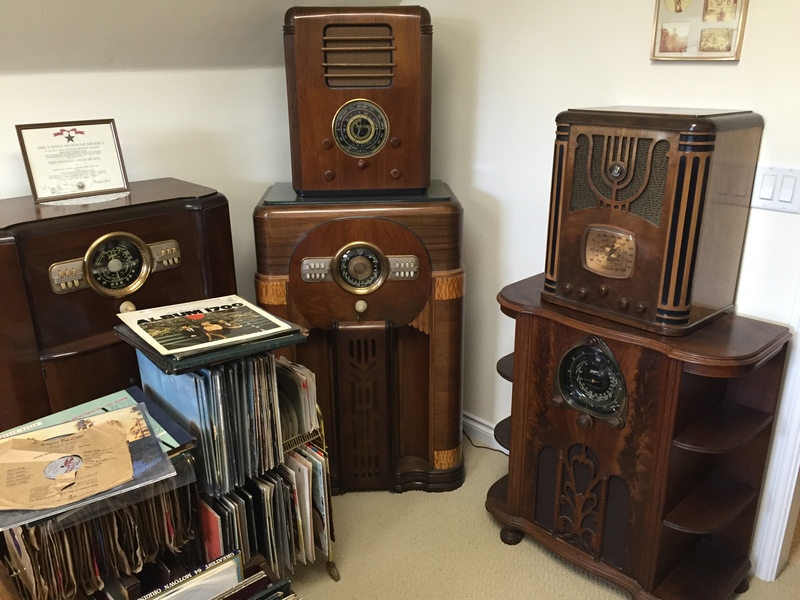 It was manufactured starting in 1939 by a Seattle, Washington company. This unit was connected to a phone line. 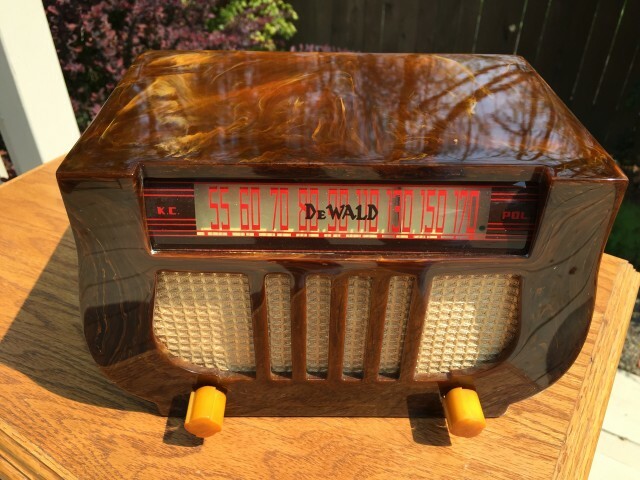 You told a female DJ what number song you wanted, and she’d play it for you through the 4-inch speaker at your restaurant booth or counter. 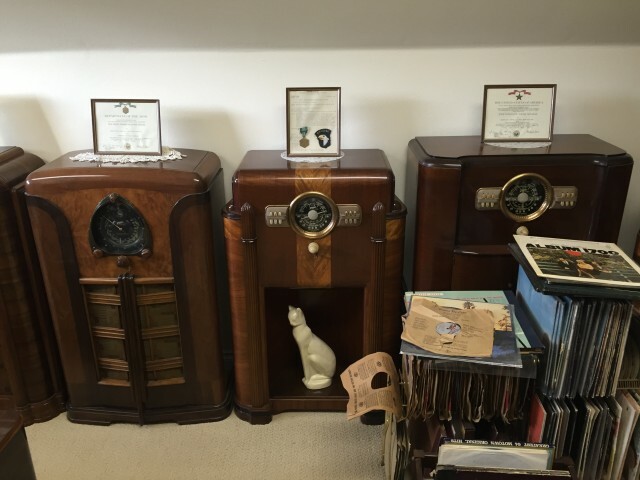 Kind of the first music “streaming”. 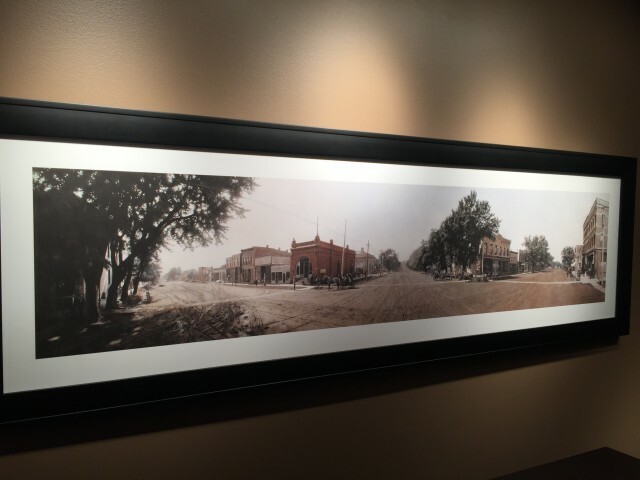 Jeannette & Dave are discussing this historic view of Blair, Nebraska done by Kent Bellows. It’s an extremely detailed hand-drawn copy of an old photo. 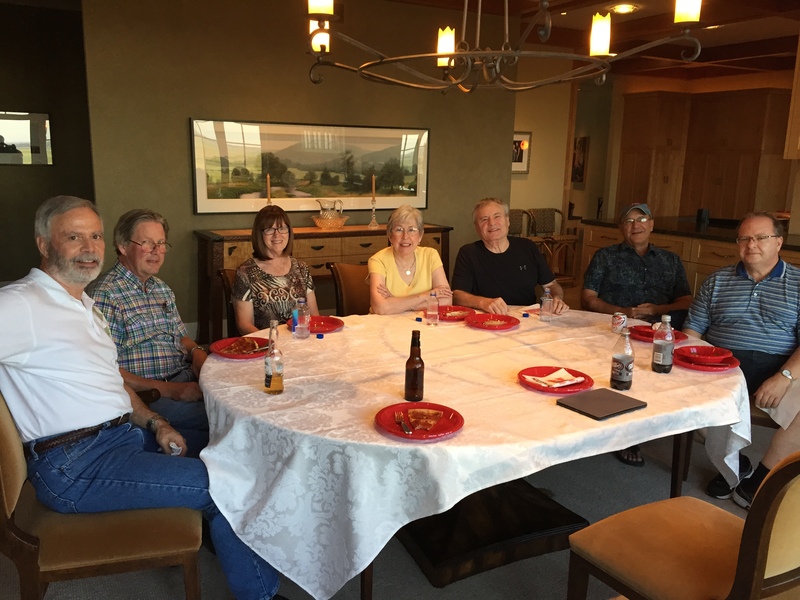 You can click on this photo, or any others in the posts to see them better. One other thing. 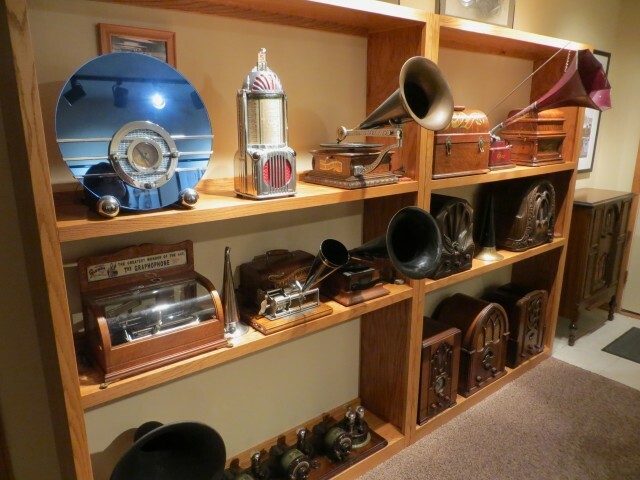 Dave supplied Hugh & Jane Hunt with much expertise and guidance as they built their fantastic radio collection. We always enjoy visiting with Dave! This 1938 DeWald A-501 Harp has a new face. 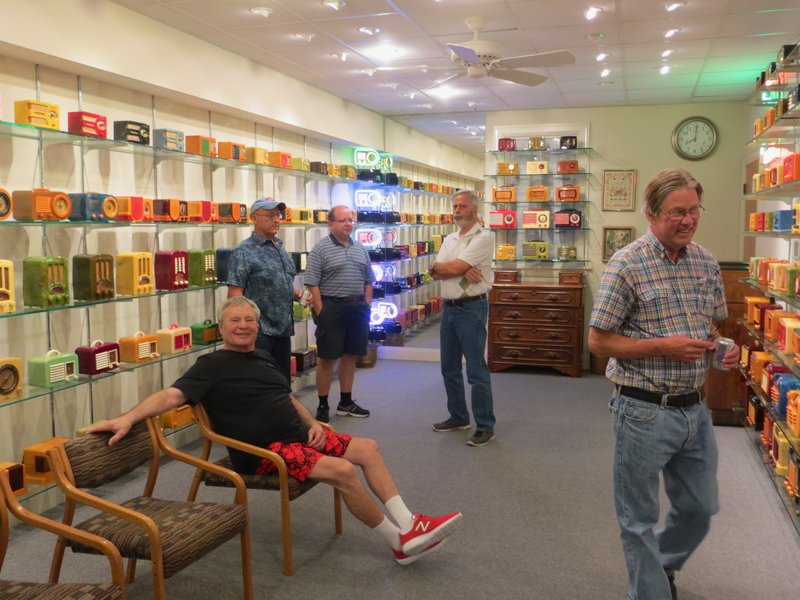 Below is what it looked like before. 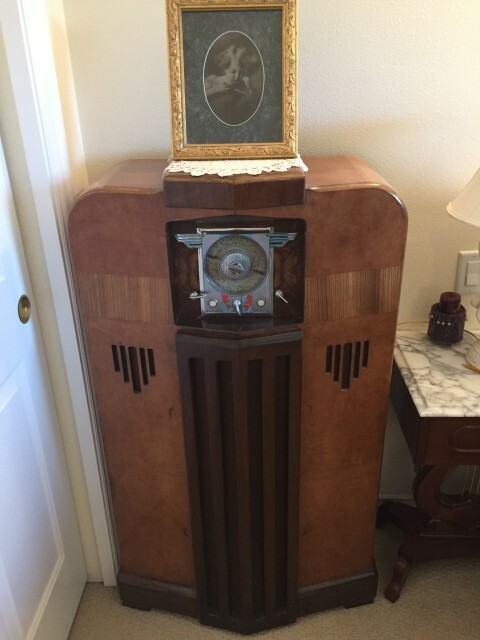 The radio looks good in both photos. 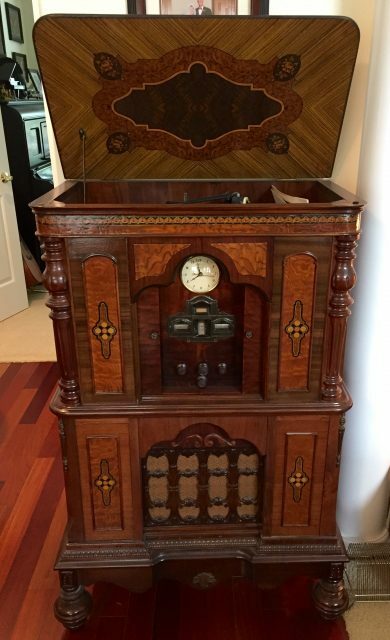 The difference is that the “new” dial in the top photo is the style that was originally in this radio. 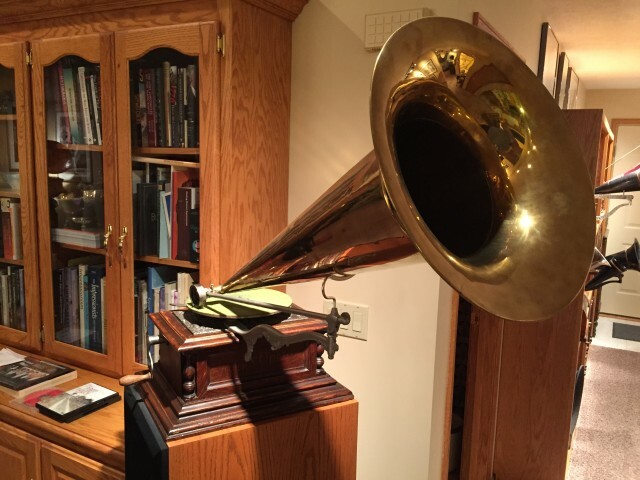 When I got this harp from another collector about six years ago, the original dial had been broken, because the Catalin case had shrunk. Fortunately, there was no damage to the case. 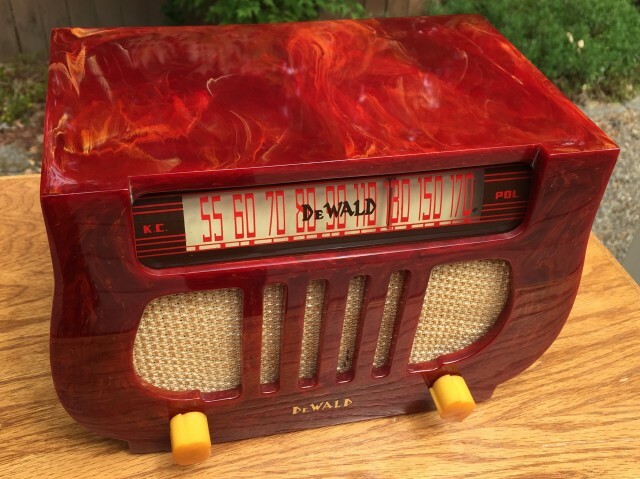 He was able to find the red & beige dial…which had been in another DeWald model…and looked okay in this one too. 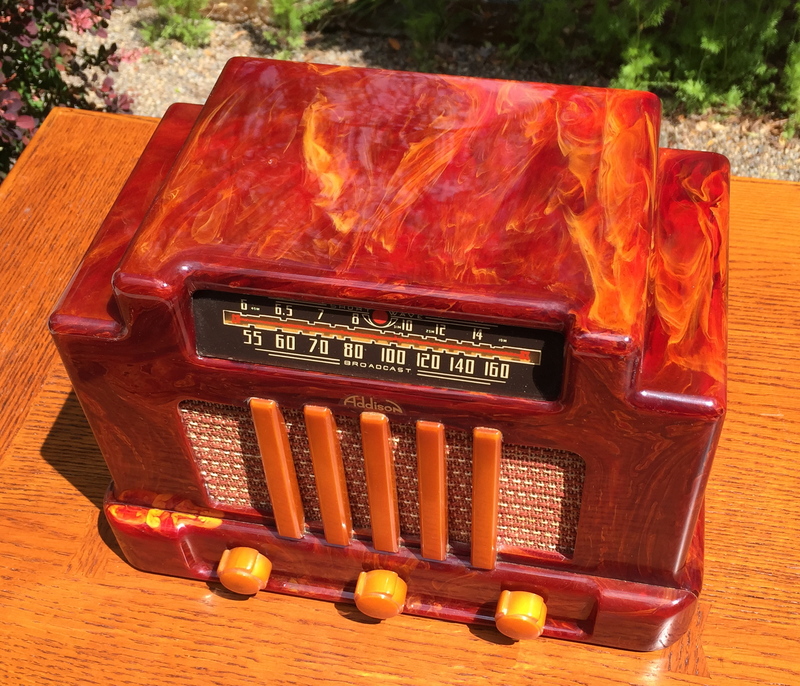 A glass company here in Oregon was a little hesitant to grind down a dial that is 77 years old, but they did a great job. 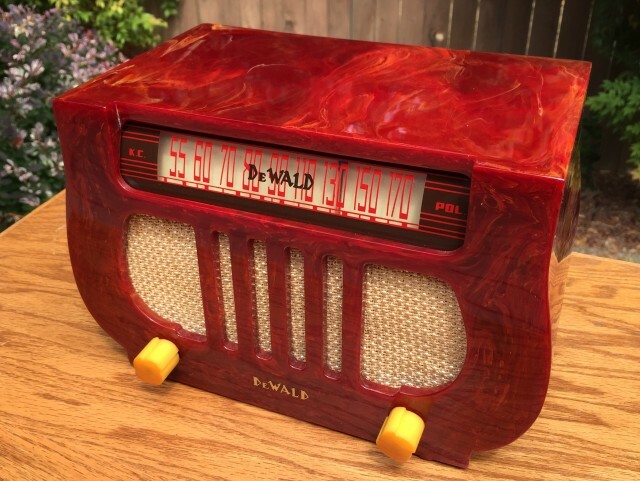 Note: After publishing this article, I’ve heard that sometimes the beige & red dial was used in the various colors of Dewald Harps, even though it was not original to this particular red Harp.